The second half of the twentieth century witnessed a quite dramatic shift in the nature of white collar employment, from lifetime tenure, often in a very hierarchical work structure, to a new model defined by flatter organizations, job insecurity, shorter tenures, declining attachment between employer and employee, and contingent work. Managing employment relations has become an issue of huge strategic importance as businesses struggle to respond to the pace of change in management systems and working practices. 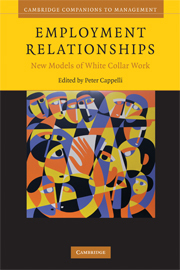 Employment Relationships: New Models of White-Collar Work traces developments in employment arrangements drawn from a number of business contexts. These include the rising role of outside hiring and lateral moves in shaping and managing careers, increased career uncertainty, and much greater variety in organizational structures - even within industries and professions - as employers struggle to meet the diverging demands of their product markets. List of figures; List of tables; List of contributors; Foreword; 1. Introduction Peter Cappelli; 2. Corporate restructuring and the employment relationship John Dencker; 3. The up and out in organizations Margaret Yap; 4. In the pursuit of quality and quantity: the competing demands in call centers Stefanie L. Wilk; 5. Three's a crowd? Understanding triadic employment relationships Matthew Bidwell and Isabel Fernandez-Mateo; 6. The changed world of large law firms and their lawyers: an opportune context for organizational researchers Peter D. Sherer; 7. The upside of bureaucracy: unintended benefits for careers in professional services Forrest Briscoe; Index.